Marine (Lance Corporal Marland Trey Kent) was honored and respected for his participation in the Iowa Powwow, to include carrying out the American flag in the Grand Entry. Iowa Annual Powwow is a celebration of homecoming and fellowship amongst tribal bahkhoje people. It is a way of renewing old friendships and building new ones. The powwow is a celebration of life. It is a full weekend of singing, social dancing, feasting and dance competitions with various tribal members from across America. This is the time when veterans, chiefs, royalty, and dancers make a grand entrance into the sacred arena. Flags are carried by veterans to honor our fallen, retired, and present veterans. They are welcoming you to come and enjoy a time of new experiences along with your family and friends. 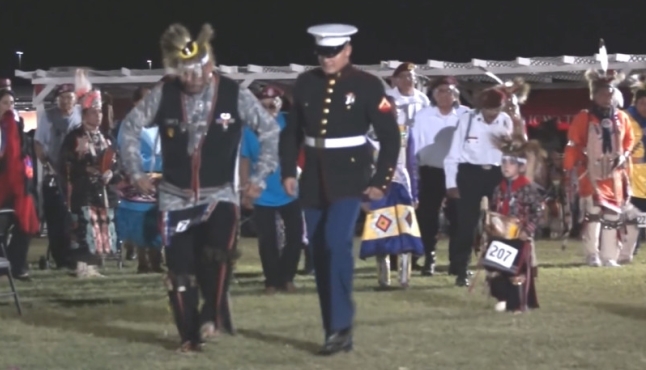 Responses to "US Marine War Dancing at Iowa Tribe of Oklahoma Powwow "
Friendship and loyalty at is best. Semper fi!